In 2017, Omaha’s volleyball team was just 4-6 at home, including three losses at their own Omaha Challenge (one pictured above). This year, it’s a different story – as of Oct. 20, they are 7-1 at home, including a 3-0 sweep at the Omaha Challenge. Photo courtesy university communications. It was Oct. 16 when the Omaha Mavericks’ Summit League winning streak came to a halt inside Baxter Arena. That halt was provided by the Denver Pioneers, in a 3-2 outcome. It was the first time this season the Mavericks had lost a home game. In the opening set, kills by Sadie Limback and Anna Blaschko helped build a 6-1 run. The Pioneers didn’t give up, and they came back with a four-point spurt through the first half of the set. However, the Mavericks maintained their momentum and held the lead through the first set. In the second and third set, the Pioneers stayed strong and maintained the lead through both sets. Omaha was down 2-1, and needing a rally. 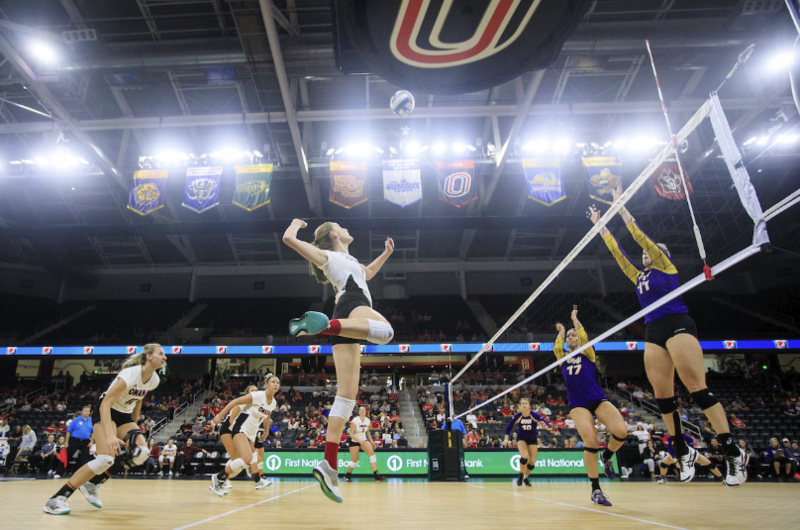 In the fourth set, the Omaha Mavericks came back with a fighting passion. After trailing 8-3 Omaha scored four points straight, cutting Denver’s lead to one. With a kill made by Isabella Sade, the Mavericks gained their first lead of 11-10. It wasn’t until the Mavericks were down 23-22 when they came out of a timeout and scored three kills – two from Limback, and one from Claire Leonard. This would force the Pioneers into a fifth set, but to no avail for the home team. The Pioneers came out with an 8-1 head start against the Mavericks. Despite the best efforts of the team, the deficit was too hard to overcome and the Pioneers won the match with a fifth-set victory of 15-8. Despite losing their first home game the Mavericks have many other things to be proud of with their season so far. The Omaha Mavericks have been the first team to force Denver into a fifth set since Sacramento State on Sept. 1. Head Coach Rose Shires garnered her 500th career win against North Dakota State on Oct. 16. Shires is now one of 29 coaches in all of the NCAA to have at least 500 career wins. Freshman Sydney Case has made waves–not only with the Mavericks, but also in the Summit League. Case is ranked ninth in the nation by having 11.53 assists per set in a game. Sydney has compiled seven matches with 50 or more assists. Sydney Case has earned the honor of being the first ever Maverick in the Division I era to earn the Summit League Defensive Player of the Week three times in one season. Case has also been the only other Maverick besides Kimberly Bailey in 2015 to win the award of Player of the Week multiple times in one season. With statistics like these, it’s no wonder how the Omaha Mavericks are in the middle of an extraordinary season. *All statistics and standings are as of Oct. 18.